Forenoon.—Meeting of Society at Wigwam at 10 o'clock. 1. Music by the Great Western Band of Pittsburg. 3. Report of Committee on place of next meeting. 5. Reading of Poem by Sergeant William Tucker, of West Virginia. Afternoon — Meeting of Society at Wigwam at 2 o’clock. 1. Music by Great Western band. 2. 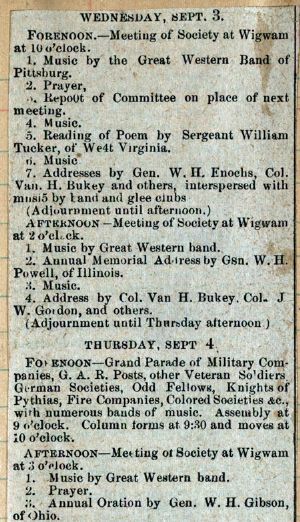 Annual Memorial Address by Gen. W. H. Powell, of Illinois. 4. Address by Col. Van H. Bukey. Col J W. Gordon, and others. Afternoon—Meeting of Society at Wigwam at 3 o'clock. 3. Annual Oration by Gen. W. H. Gibson, of Ohio. 5. Addresses by General Hayes, Col. Lawrence, Capt. Dovener and others, interspersed with music by band and glee clubs. Evening.—Meeting of the Society at Wigwam at 8 o’clock. 2. Report of Committee on Officers for the ensuing year. 3 Addresses by distinguished speakers, interspersed with music by band and glee clubs. Clay Pigeon and Glass Ball Shooting, Wednesday, at 10:30 A. M. In West Virginia, near Blue Bridge. Base Ball Match, Wednesday, at 3 P. M., on ground near Lena Furnace. Great Western Band Concert, Wednesday, at 8 P. M., at Wigwam. Admission, 25 cts. Grand Parade, Thursday, at 10 A. M. For formations, list of marshals, route of procession, etc., see newspapers. Tournament, Thursday, at 2 P.M., on course in rear of Queen City Hotel.